Keep an eye out for something much, much, much tinier than whales. Make for the Pacific and search for signs of bioluminescence on a cruise hosted by Dana Point's Ocean Institute. BUT... our region's famous whale-watching cruises aren't the only on-the-water boat trips that head out, further into the deep, to look for the gifts of the mighty Pacific. There are cruises that look for something far, far, far, far smaller -- four "fars" should do it -- than a whale, an organism so eensy that it might appear at the opposite end of one of those posters that line up the smallness-to-bigness of every earthling. For if the whales are on one side of that poster, than euphasids -- "small 'bug-like' organisms" -- must be near the other end. They're tiny, but they pack a visual punch on the right night, as people who've joined an Ocean Institute Bioluminescence Night Cruise have discovered. 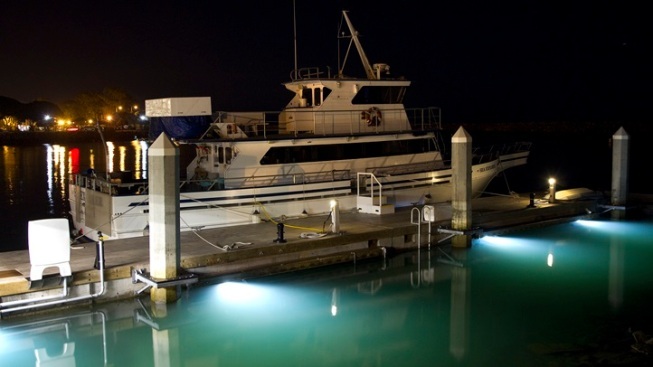 The Dana Point on-the-water trips depend on factors like what phase the moon is in, so they happen every so often, but when they do, it can be glow-water magic. WELL, NOT MAGIC... but the science of why euphasids show up, on board, when a net is drawn up the boat's side, carrying their own very tiny flashlights. (Not really, but figuratively.) It's beauty, it's ocean poetry, and it is rife with knowledge and marine-fascinating facts. Want to see that sometime, so it can fill your head and stir the science-y parts of your brain and heart? Keep a watch for the next moon phase, and trip, here. Tickets are $35 per adult, $22 for kids ages 3 to 12. Glowing ocean stuff! Can we get a "wow"?